"I'm just looking out for my loved ones, that's all." Sony Pictures Classics has unveiled an official US trailer for Sebastián Lelio's acclaimed drama A Fantastic Woman, from Chile, which premiered at the Berlin Film Festival this year to quite a bit of international acclaim. The films stars transgender actress Daniela Vega as Marina, a transgender woman living in Chile who must deal with the challenges of oppression and hate when her older lover suddenly passes away. His family rejects her and everything seems to start falling apart in her life. The cast includes Francisco Reyes, Luis Gnecco, Aline Küppenheim, and Nicolás Saavedra. I saw this film at Berlinale and it's good, but it didn't totally win me over. It's still an important film for trans actors and trans storytelling, and deserves attention for that reason. Definitely worth a look. Marina is a young transgender waitress and aspiring singer. Orlando, 20 years older than her, is the owner of a printing press. Marina and Orlando are in love and they both plan a future together. After Orlando dies suddenly, Marina sees herself forced to confront Orlando’s family and fight again to show everyone what she is: a complex, strong, honest and fantastic woman. 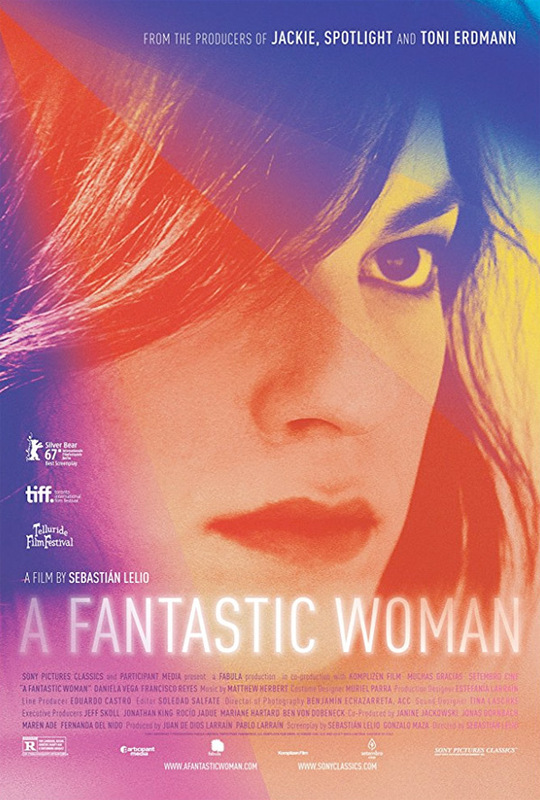 A Fantastic Woman is directed by Chilean filmmaker Sebastián Lelio, of the films The Sacred Family, Christmas, The Year of the Tiger, and Gloria previously. The screenplay is written by Sebastián Lelio & Gonzalo Maza. This first premiered at the Berlin Film Festival, and is also playing at the Telluride & Toronto Film Festivals this fall. Sony Classics will release A Fantastic Woman in select US theaters starting on November 17th this fall. Anyone interested?